Camping Rino – Feel Like Home! Now camping have more space (5000m2 ) and we have capacity for 50 to 60 campers or tents, more space for Familys with childrens, good space for groups with Tents in shadow and also place for Caravan clubs Group. We accept reservations groups with Caravan clubs, Hikers, Scout Groups. Camping Rino, we, pride ourselves on welcoming guests to our camp and treating them like family. We provide a warm, relaxing atmosphere, and friendly service to create the memorable stay you deserve. Camping Rino offers guests at the arrival day free coffee, tea, or raki, also each morning free coffee. Rino is open all year round. Our 14 years experience working with tourist make our staff more profesional, explaning them more about turistic areas, Macedonian culture, tradition and history. We make tour around the Lake Ohrid by car, visiting Ohrid ancient city, old Roman churches, castle and ancient theatre, also Water Museum and St. Naum churches and spring water. Enjoying the view from National Park Galicica amazing and relaxing place, passing Albanian border around the Lake Ohrid. Exploring the beauty of nature. 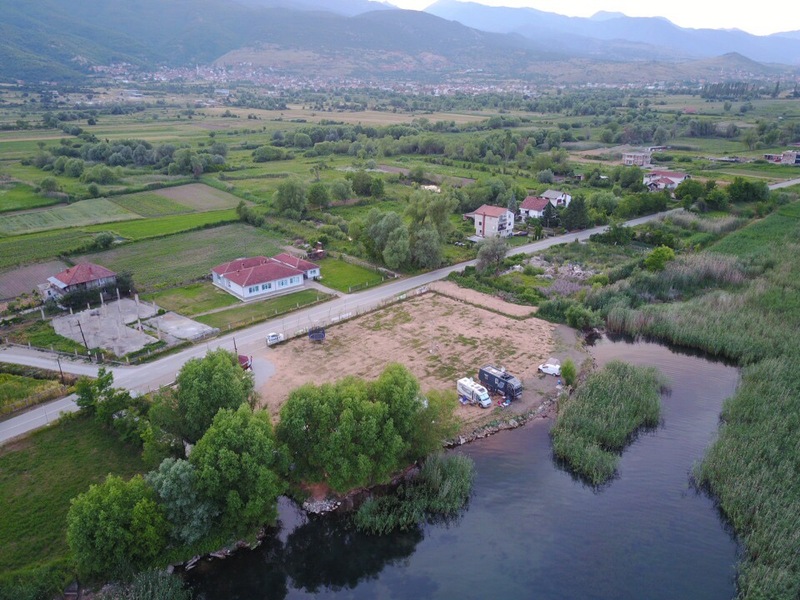 Rino Caravan and Camping Site is a sheltered, small and nice site directly on water which makes one of the best places and amazing view around the Ohrid Lake. 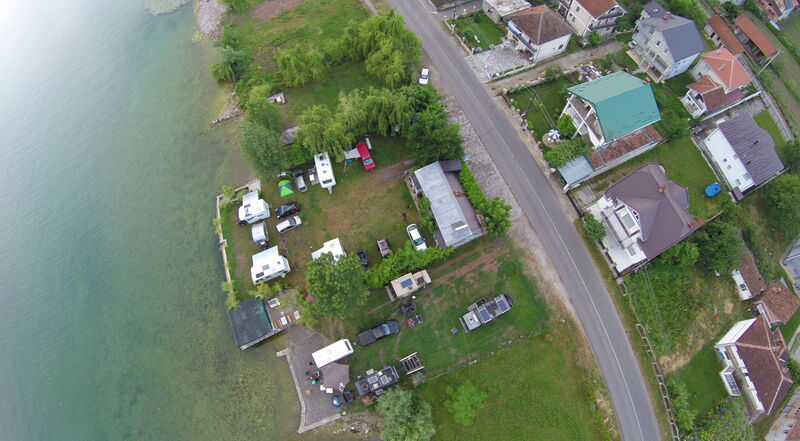 Our family-owned campsite is situated in the village of Kalista, city of Struga, near to the border Albania and Macedonia. Explore and enjoy a range of water and land based activities or relax in this truly idyllic location which is recognised as a place of outstanding natural beauty. Our camping provides a range of activities suitable for all ages and abilities, try something new on your holiday in the Camping Rino and give kayaking, fishing, hiking or cycling a try. We also offer road trip around Lake Ohrid. There are plenty of beautiful places around Lake Ohrid, such as Mountain Galicica National Park, Museum on Water, Black Drim River, Ancient city of Ohrid, etc. You can walk to the closest church St. Bogorodica, which was build in 14th century. It is just 1 km far from campsite and has amazing view to the lake. You can rent a boat to go to next towns like Ohrid, Struga, Pestani. 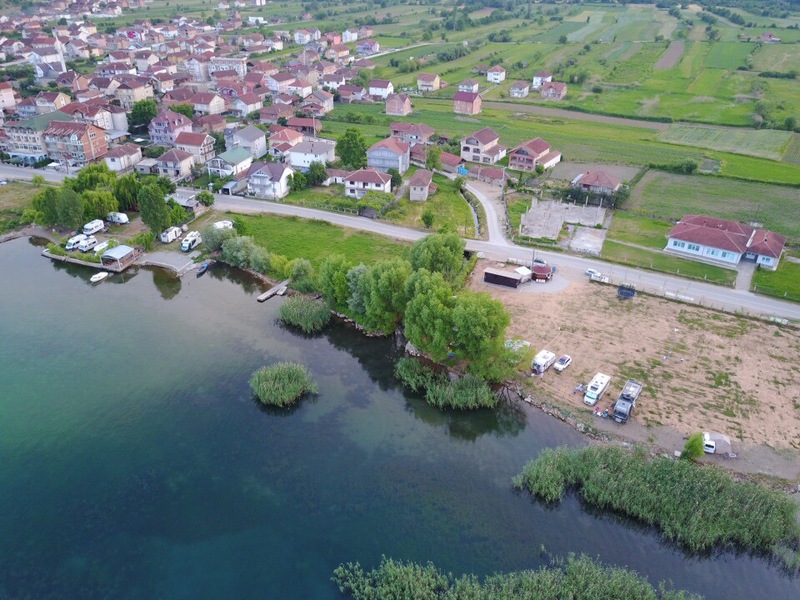 The camping is located in quiet natural surroundings by Lake Ohrid and about 3 kilometers from Struga and 16 kilometers from Ohrid city. It’s a family run campsite, expanded space and safe for children. We have place for about 50 to 60 tents or caravans. With a field directly next to the lake ensuring a quieter, peaceful stay. Around the campsite you can walk, visit one of the cities, go for a swim or fishing with our rowing boat. Observe in your own way the Macedonian and also Albanian life. WHY YOU SHOULD VISIT RINO ? 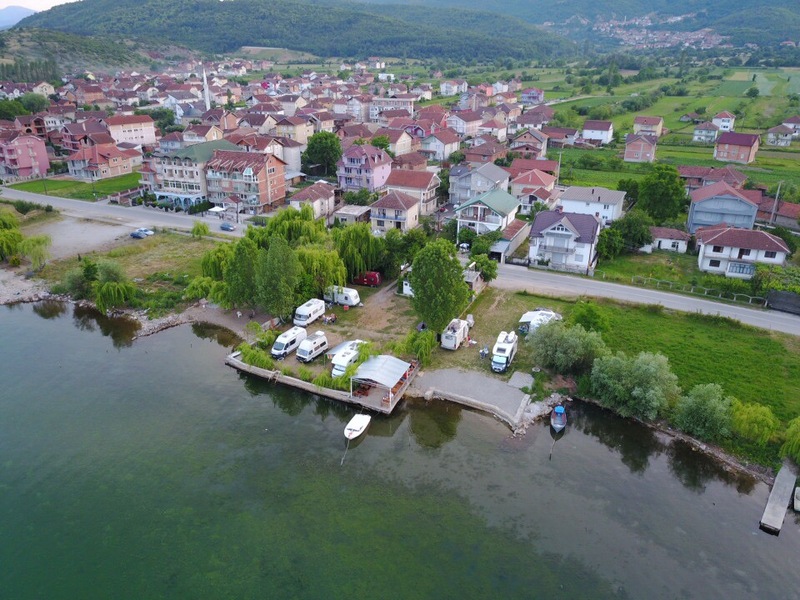 Camping Rino is campsite that lies at the shore of Lake Ohrid, a beautiful location surrounded by water and nature in the village of Kalista. Our campsite may be a simple little place, but the view is astonishing, thanks to its position. The first thing that meets you on arrival is very warm welcome with warm coffee, tea or raki from house. From the small tents to the big camper vans, all camping-styles are admitted at Camping Rino. The campsite enjoys a pleasant temperature all summer round, and tranquility reigns during the day and the night. A perfect place for resting. It has a attractive offer of activities thanks to its privileged location: hiking, kayaking, biking, fishing or practicing adventure sports. You can enjoy your time in the nature like nowhere else. A perfect place for active travelers. 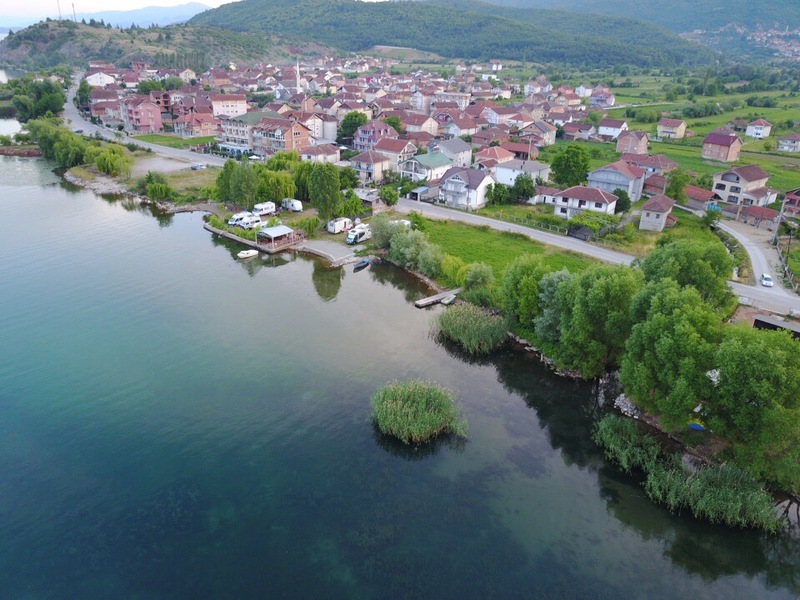 Struga’s location on the Lake Ohrid is high 700 m above sea level and makes it a slighty, peaceful place. When you visit this beautiful town there are a many other places that show the beauty and culture, the century of old churches, the mosques and old bazar. During the day you can enjoy Struga beaches located close to River Drim in its own flow and between to the two previous beaches. Every middle of August “Struga Poetry Night” is held at the “Poetry Bridge” and is attended by Poets, Writers and Artist across the world. 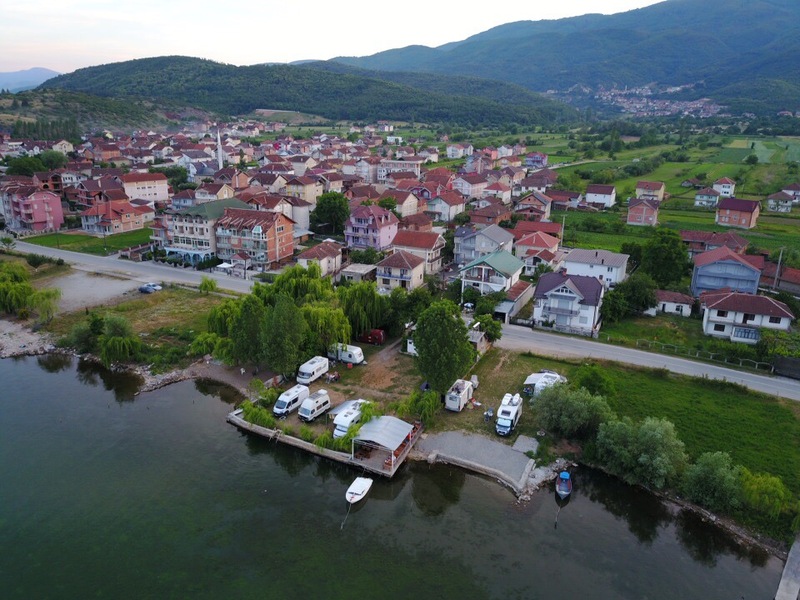 The village of Vevcani is located 14 km North-West of the town of Struga. The famous Vevcani springs are some of most famous springs to be found in Macedonia. The springs are located on the eastern slope of Jablanica mountain range. The largest spring is located at the opening of one of the many caves in the region. Below the largest spring are ten minor springs which all converge together. The most famous spring is “Jankov Kamen” which is situated at 1200 metres above sea level. Another spring is “Mala Livada” from which the water has a unique flavour and colour. It is situated at over 1600 metres above sea level. The highest spring is “Golina” situated at over 2000 metres above sea level. The rate of water flow from the springs is estimated to exceed the rate of 1500 litres per second, most notably in Spring. Within the vicinity of the village of Vevčani there are many glacial lakes. The highest and mot prominent glacial lake is “Lokva” which is situated at over 2000 metres above sea level on Mount Jablanica. It is the main provider of water to the “Golina” spring. Ohrid City is the largest city on Lake Ohrid and the eighth-largest city in the country. Ohrid is notable for once having had 365 churches, one for each day of the year, and has been referred to as a “Jerusalem of the Balkans”. Ohrid and Lake Ohrid were accepted as Cultural and Natural World Heritage Sites by UNESCO. In fact, Ohrid is one of only 28 sites that are part of UNESCO’s World Heritage that are both Cultural and Natural sites. 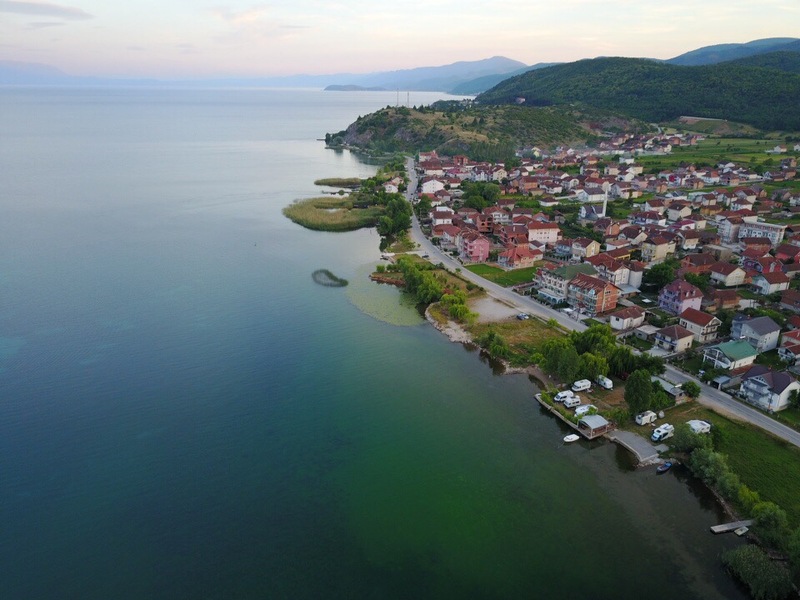 The earliest inhabitants of the widest Lake Ohrid region were the Dassaretae, an ancient Greek tribe and the Enchelei, an Illyrian tribe. According to recent excavations by Macedonian archaeologists it was a town way back at the time of king Phillip II of Macedon. They conclude that Samuil’s Fortress was built on the place of an earlier fortification, dated to 4th century B.C. Near centre of Ohrid in top of hill is Samuil’s Fortress, the view is amazing and you can see Lake Ohrid around, next to castle is also an ancient theatre which was built in 200 BC and is the only Hellenistic-type theatre. Also in Ohrid passess the Ancient Roman Road “VIA EGNATIA”. The National Park Galicica is situated on Mount Galicica, that is a part of the mountain range of Sara-Pind. Due to its exceptional natural beauty and extremely opulent and endemic flora and fauna, in 1958 the Macedonian section of the mountain was proclaimed a National Park. The Park covers an area of 227 km2 between the Lakes of Ohrid and Prespa, and it stretches in a meridian direction. The two stunning Ohrid and Prespa lake sit high in this mountain range, with Prespa Lake at 850 meters and Ohrid Lake at 693 meters, and both are visible from the top of Galicica Mountain. Containing more than 130 different species of trees and bushes Galicica is one of the Europe’s richest national parks in terms of flora. Well marked mountaineering and hiking trails, rich cultural inheritance of Galicica National Park and its surroundings, and it proximity to Ohrid, attract nature and culture lovers as well. Beautiful views across the lakes and neighbouring mountains can be seen from the Galičica peaks. The highest is peak Magaro (2,254 m). From top of Galicica you can see both sites Lake, Ohrid Lake and Prespa Lake. This camp was amazing, i suggest you should visit this area, i had very good time near the lake. Also people was so friendly so kind, it’s very quite place and lovely. For me camp Rino was the best one around Ohrid Lake. Thankyou with pleasure David. Thank you David . we will ! if you would like to fly up to the skies and to look on the country from the above. does vary depending on geographic location. A very small camping next to the lake. A very friendly owner, who serves very good coffee in the morning and speaks German and English. You might meet people from all over the world, who are on a trip by car or bike and tent or camper. Lake. When you make a Balkan Travel, is Camping Rino definitely the best Camping Place in Macedonia, Albania and Grecce. Been twice at Rino. First in 2013 during an alone motorcycle trip around the Balcans, last time 2014 with 3 more friends during another motorcycle trip that took us ’till Ukraine. We all agree that after so many days driving Rino was a superb place to rest, enjoy the lake (With its snakes! ), sun, food, and Skopjsko beer! If I ever return to Macedonia I’ll pass by Rino for sure. That was the best camping I have ever been to. And I’ve been to quite a lot of them. 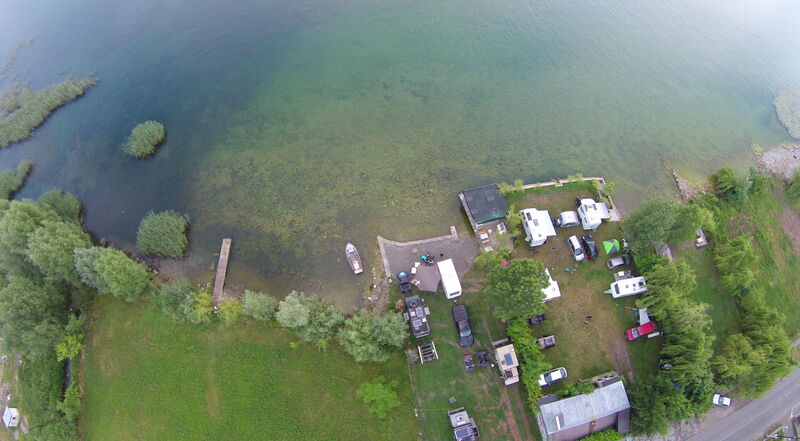 The campsite is small and full of familiar atmosphere, the people unbelievably nice and ready to help, the lake right there, warm, beautiful and full of fish. Talking of fish, I highly recommend trying some of them prepared right there on the campsite. Cheap and very tasty! we loved your hospitality and beautiful camping site. You all are brilliant. Auf der Durchreise von Griechenland nach Kroatien waren wir mit 3 Fahrzeugen für 2 Nächte auf dem Rino-Camping. Ein kleiner, sauberer und sehr gut geführter Platz. Besonders war der morgendliche Kaffee mit einem herrlichen Blick über den See. Die ganze Familie ist sehr freundlich und hilfsbereit und auch das Essen im kleinen Campingrestaurant ist sehr zu empfehlen. Eine wirklich sehr gute Adresse. Do you have any availabilities for tomorrow night? We are 2 persons with one tent. The camping looks really nice and amazing coments..
Nous vous avons envoyé un mail pour réserver du 06 au 11 août, j’espère qu’il y aura de la place ! Hi. Hoping to visit with a very small one man tent around Saturday 8th August. Will it be okay just to arrive. Good place to camp. I like its scene, those surroundings will have a perfect fun. The campsite we had in the itinerary as alternative accommodation in the journey to Albania. We are glad that we finally stopped, ate dinner, bathe and sleep. Nice place, nice people, -). Grazie Rino per i bellissimi giorni passati con te! We visited Rino Camping in August 2016 during Our 8 month Tour-de-Europe. A wonderful Place With wonderful staff. We really enjoyed Our stay here ! Pimi the perfect host, superb food and coffee, beautiful setting of the campsite. Nothing more to say then go and see yourself! We’ve just arrived to a great welcome, raki and coffee as the sun sets. Stunning location, small and friendly site with a bar / restaurant. The place is beautiful with great view on the lake and mountains ! The whole staff is very kind and friendly !! Lot’s of little gifts and advices … You must stop here !!! It’s open all year long ! PS: try the trout ! Ich habe gelesen mehrere good Sachen hier. Definitiv Sicherlich lohnt bookmarking Änderungsvorschlägen. I eine Menge Versuch Sie Set bis diese Art der ausgezeichnete Website. Highly recommend staying at campig Rino. We stayed with 14 young adults and were very pleasantly surprised. The hospitality was amazing! Unlike other tourist based places it is a very honest and correct camping place for both tents and campers. Some trees are still growing and the beach was still being constructed. A very cosy and quiet camp site with direct access to the lake.